A mix of established Rio Olympic campaigners and emerging young talent shared the top podium spots when the 48th Trofeo Princesa Sofia IBEROSTAR ended Saturday with a brisk 25kts Mistral offshore wind which brought the 646 boat regatta to spectacular, challenging finale. 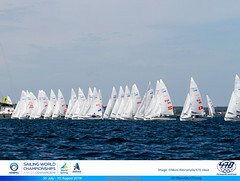 The event which traditionally raises the curtain on the new European Olympic seas started in light winds Monday, before the 8-10kt reliable Bay of Palma sea breeze prevailed, but when new format final races were scheduled for several classes the big breeze blew in. 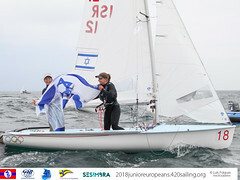 Confidence and accomplished crew work in the strong breeze and choppy waves made the winning difference for the jubilant Japanese pair Tetsuya Isozaki and Akira Takayanagi. Their third place in the Medal Race – trialled here at eight boats – was enough to overhaul Sweden’s Carl Frederick Fock and Marcus Dackhammar who finished a painful last in the medal race and so losing the gold by one single point. 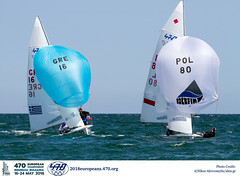 The Japanese duo finished second in Miami. There was an encore performance in the 470 class where the Dutch duo Afrodite Zegers and Anneloes Van Veen repeated their success at Sailing World Cup Miami. Zegers, a concert pianist who has put her music aside as she pursues the Olympic dream in the 470, grew up in Athens, Greece before moving to Holland in 2011. Both girls are also pursuing degree courses away from sailing. The duo have raced together since 2012. “We are very different, have different backgrounds and complement each other. She keeps my calm at the right time. Physically we are both very good together and just work very hard,” said Zegers. “Most of the regatta would be Chopin or Liszt but today was definitely a Rachmaninov kind of day!” grinned Zegers.